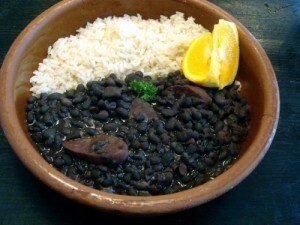 Black beans are a fantastic way to spice up many dishes, especially your Spanish dishes. Many people simply don’t use black beans because they don’t know how to cook with black beans. Instead of purchasing a can of precooked refried beans you can make your very own at home. You will need a manual potato masher for this recipe. First add the butter to a medium sized sauce pan set on medium-low heat. When the butter is melted you will then add your chopped onion, minced garlic and salt. Once the garlic and onions have had time to properly sweat you will add your black beans and pepper. Let the beans saute in the sauce for roughly 5 mins before taking the potato masher to them. Blend and mash the beans until you achieve the consistency you desire. Serve on tacos, burritos or even on nachos!